How do European officials working on agriculture and food topics deal with the emerging data revolution in the sector? How can they be aware of the recent developments in a way that may inform their thinking? And how can they respond to the community needs by appropriately shaping the policy programs and support instruments? This was the topic of a meeting that took place in Brussels on September 30th, 2016. 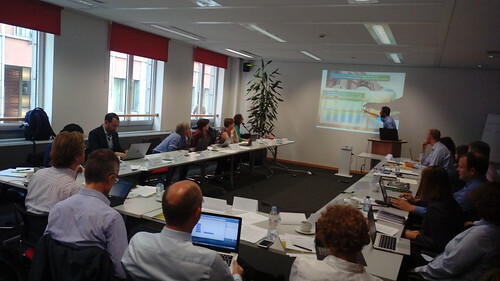 The meeting was organised by the Big Data Europe project, in collaboration with the Global Open Data for Agriculture and Nutrition (GODAN) initiative. The Food and Agriculture Organization (FAO) of the United Nations and Agroknow, being the Big Data Europe partners responsible for the food and agriculture sector, worked together with the Institut National de la Recherche Agronomique (INRA) in order to invite to the meeting representatives from the European Commission (EC) DGs and a select group of community stakeholders. The meeting aimed to share recent developments in the agri-food community (such as the Chania Declaration and the GODAN-endorsed activities on creating a data ecosystem). One of the key discussions was around how the community intends to build a common roadmap for the data infrastructure elements that the agri-food sector needs (covering aspects such as physical structures, software, standards, and governance). 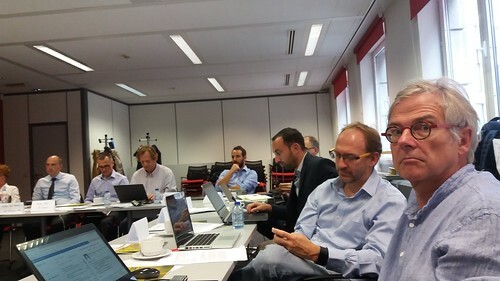 The event also gave the opportunity to EC representatives (from DG AGRI, DG CONNECT, DG RTD implenting the Food2030 Agenda, as well as the teams of the EU Open Data Portal, managed by the Publications Office of the European Union) to share with the community representatives recent developments of interest to our sector. 1) Towards a Data Ecosystem, where presentations and discussions took place around how the creation of a common, shared data ecosystem for food and agriculture can be catalysed. 2) Scientific Communities & Open Research Data, where scientific stakeholders presented data infrastructure views and initiatives on the topic, from both Europe and internationally. 3) Data-powered Tools & Services, where participants presented relevant global and regional infrastructural components for data management and data sharing. All meeting presentations are available online. Convening mechanisms for making these consultations systematic (and seeing if the EC can also build the case for further systematic investment); also to help align the technology investments (avoiding duplication). Developing new incentives and business models for data sharing (think of automated mechanisms besides “stick and carrot” incentives). Focusing on the work still needed on interoperability and standards, especially on demonstrating impact and collecting use cases and stories to more clearly understand what is needed / missing; think of evolution of standards into Standards-as-a-Service. Developing of shared, common data infrastructure services (data and service registries, big data processing and analytical components, etc.) and agreed reference datasets (as standards and for learning mechanisms). In this meeting, Agroknow’s was heavily represented with Nikos, Pythagoras and Panagiotis. In his intervention, Nikos talked about the way in which Europe can be positioned in the global context, focusing on the role that it could play as a leader of the upcoming data revolution. This built upon the arguments recently published in our corresponding position paper “Can Europe lead a data revolution in agriculture & food?“. We are looking forward in taking the discussion further! The post European Policy Perspectives on Data-intensive Agriculture & Food was first published on the Agroknow blog. One of the fun things we did during our visit to Ontario this September was our meeting with Canada’s first NSERC Industrial Research Chair for Colleges: Dr. Mike Duncan. With a specialization in Precision Agriculture and Environmental Technologies, the five-year mission of Mike as a NSERC Chair was to develop data-powered solutions for provincial and national farming communities. Mike, Gregor MacLean and the Agriculture & Environment Innovation Center team at the Niagara College are focused on developing new ways to gather, process and disseminate the massive amounts of data gathered each day from Ontario farms, including the use of an experimental unmanned aerial vehicle (UAV) and field sensors. It all started in 2007, when an Ontario Centres of Excellence (OCE) grant established Niagara College firmly in the area of agricultural remote sensing and visualization with the PrAgMatic project which aims to help farmers increase crop yields while reducing dependence on fertilizers and water, therefore reducing environmental impact. The PrAgMatic system currently encompasses a host of technologies, including GIS/GPS, databases, 2D and 3D visualization, digital soil mapping (DSM), image classification, sensor networks, LIDAR, and other remote sensing technologies. In 2009, Niagara College received one of the first Community College Innovation (CCI) grants of $2.3 million for the development of the Land Use Technology Centre to further focus on the PrAgMatic project. This work attracted the attention of local and international partners, including Ontario Ministry of Agriculture, Food, and Rural Affairs (OMAFRA), and IBM. One of the applications of particular interest for Agroknow is the real-time monitoring of vineyards that Mike and his team have deployed in Ontario, collecting a large amount of sensor data. The main challenge that the team is facing in their work is processing and translating the data into usable information. The big idea at the heart of this research is the development of systems that do not only process the large datasets collected by the various sensors, but also display this data on three-dimensional maps directly to the farmer in real time. Real time data is optimizing farm operations and having a positive environmental impact. We have spent a whole morning with Mike and Gregor discussing about how big data technologies (like the ones that Big Data Europe is deploying) can help delivering their vision of what practical impact technology can have on the future of agriculture – behind and beyond the farm gate. We have agreed to establish a collaboration between the two teams and find ways in which we can develop and deploy solutions that can be applicable in farms all over the world. The post Agroknow visits Canada to talk about big data in farms was first published on the Agroknow blog. The National Institute of Food and Agriculture (NIFA), a federal agency within the United States Department of Agriculture (USDA), is convening a summit to identify the frontiers and future of data in agriculture and build on existing U.S. government wide-efforts and investments in Big Data. Save the date for an opportunity to help shape the agenda driving innovation in the agricultural enterprise. You can join the event via livestream as leaders in agriculture and data science fields converge to synthesize the future of data-driven agriculture. This October 10, 2016 event entitled “Data Summit: Changing the Face, Place, and Space of Agriculture” will include an address from NIFA Director Dr. Sonny Ramaswamy, a set of visionary talks from leaders in the fields of data science and agriculture, and discussion. The preliminary agenda includes topics related to exploring the anticipated data benefits and opportunities, exploring potential challenges in Data Application and Management, human elements of Agricultural Data, to name a few. This event will be streamed live in tandem with the October 10-12, 2016 NSF Midwest Big Data Hub All Hands Meeting. To express interest in participating in the event and get more information and live stream details, visit: https://nifa.usda.gov/event/data-science-agriculture-summit. The post Data Science in Agriculture Summit was first published on the Agroknow blog.